The Control-L SDK for windows allows rapid development of video control software. **NEW** .NET CONTROL Simple Integration into VB .net, C# etc. Control-L (LANC) compatible video equipment is connected to the PC with the supplied interface Cable. 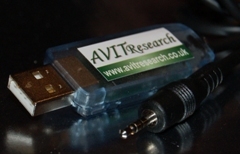 The cable has a 9pin D-connector at the PC end and a 2.5mm stereo jack at the video end. The cables interface electronics are contained within the 9way D-connector. The circuit layout of the interface cable are provided on request to allow developers to integrate the video control interface into their own hardware. The interface cables and pre-programmed micro-controllers are available separately. Software libraries and components hide all the difficult control-L implementation including all serial port communications. A multi-thread DLL and OCX allow simple and rapid video control functionality to be integrated into C, Visual Basic or Delphi applications. The .NET Control, can be dropped onto an application form and allows rapid development of video control applications. Example code is given for both C and Visual Basic to show how applications can be efficiently developed using the SDK. §Note Cables may only be purchased if a SDK has already been registered, or included with your order.